Make yourself at home in a downtown Wichita two bedroom apartment! If you are looking for an affordable two bedroom apartment, Bokeh Development has a number of two bedroom apartments that are the perfect place to call home in downtown Wichita. Experience city living in a two bedroom apartment in Wichita at The LUX, The Renfro, or Zelman Lofts. Each of these properties have cheap two bedroom apartments that are a short walk away from downtown entertainment and plenty of restaurant options. If you’re looking to rent a two bedroom apartment, the possibilities are endless with a downtown apartment from Bokeh Development! We offer affordable two bedroom apartments, so be sure to contact us for a tour of our available two bedroom apartments in Wichita. 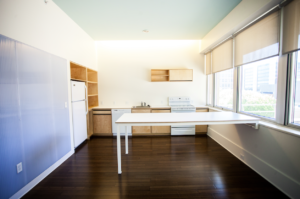 You can also see which units are available and check out our two bedroom apartment floor plans here.